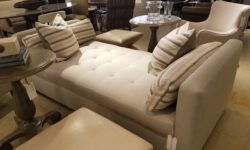 With a broad range of furniture styles, an appreciation for American craftsmanship, and a strong commitment to earth-friendly manufacturing techniques, Tritter Feefer Home Collection is the leader in fresh, transitional furnishings. With a rich background in retail home furnishings, antiques, and interior design, we discovered a passion for creating our own line of furniture after a cross-country move. A desire to be closer to our son and grandchildren, Tristan and Faith (nicknamed Tritter and Feefer), took us from Colorado to Georgia in 2007, where we teamed up with skilled craftsmen to build our fresh, transitional furnishings. Our unique finishes, our environmentally conscious manufacturing approach and our ability to customize the sizes of most of our product range have made us unique in the marketplace. We feel privileged to work with some of the most creative retail and interior design businesses in the country, and our dedicated employees appreciate the opportunity to meet the challenges of manufacturing in America.